Services are scheduled for 10 a.m. Saturday, Jan. 6, at Ballard Funeral Home Chapel in Roswell for Aileene Good Taylor. Taylor, 68, wife of the late Billy Jack Taylor, passed peacefully in her sleep into the arms of our Heavenly Father Tuesday, Jan. 2, 2018. Interment will follow the services at the General Douglas L. McBride Veterans’ Cemetery. 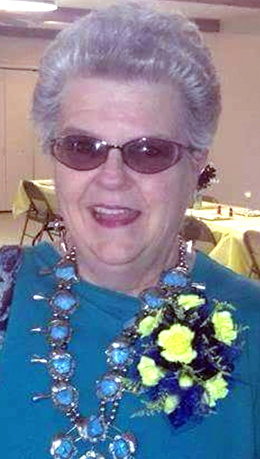 Visitation will be held from noon – 7 p.m. Friday at Ballard Funeral Home. Aileene was born March 1, 1949, in Midland, Texas, to Robert W. and Charlotte D. Good. On July 12, 1969, she married Billy Jack Taylor. Aileene is now happily rejoicing in being back with the love of her life, whom she dearly missed. Aileene worked for many different government offices, utility companies, and banks during her career. If you were to ask her, her career was moving and relocating with Billy, who was a New Mexico State Police officer. She was always very proud to be a wife of a dedicated police officer. Survivors include sisters Andrea Rose of Derry, N.H., Trudy Lusk of Loudon, Tenn., and Sheila Judson and Martha Caswell, both of Los Lunas; son Eric Dean Taylor and wife Pamela of Roswell; and daughter Kellie Morgan and husband Jimmy of Roswell. Aileene always felt fortunate to be blessed with her grandchildren and great-grandchildren. Her grandchildren include Nicolas Dean Taylor, Eric Dean Taylor Jr., Kyla Morgan and fiancé Shadduc York, Krysta “Kryssie” Morgan and fiancé Joseph Espinoza, and Gracie Roberts, all of Roswell. Great-grandchildren are Karlee Morgan, R’ia Morgan, Kristopher York, Jimmy York, and another little blessing due shortly. Aileene was so proud of her family and always committed to them. Arrangements are under the direction of Ballard Funeral Home and Crematory. Condolences may be expressed online at www.ballardfuneralhome.com.